Good Chemistry Nurseries is dedicated to cultivating the most consistent, high-quality cannabis available, including our exclusive strains Ingrid and Mr. Good Chem, and our highly acclaimed Sour Diesel, Blue Dream, OGer, and Durban Poison, along with many others. And the best part? All of the strains Good Chemistry offers are $30 per 1/8th. That’s right, $30 per 1/8. Every strain. Every day. The daily flower menu at Good Chemistry is updated depending on the strains available. The menu is always changing due to the flowering schedule of the plants at the nurseries, so if you are looking for a specific strain it is a good idea to check and see what strains are available at each location. But don’t stress if the strain you are looking for isn’t available, the Good Chemistry budtenders are trained to help customers navigate the wide world of cannabis to find a strain that will suit what you are looking for. Along with our extensive flower menu, Good Chemistry also has an assortment of edibles, our new solvent-less rosin, pre-rolled joints, and a wide range of accessories. 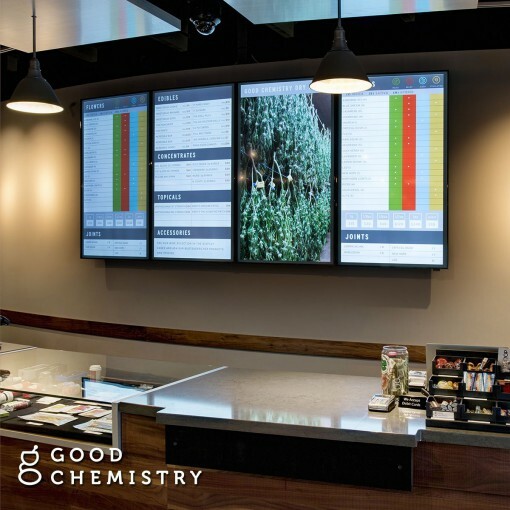 Take a look at our updated flower menus and stop by Good Chemistry for an amazing cannabis experience. Learn more about Good Chemistry Nurseries products by clicking here.